Historic data indicates Denver - area will see annual appreciation in housing prices during general election years. The market remains robust amidst record low inventory for the month of October and drop in home sales. Year-over-year average price of homes sold up 9.96 percent to $398,588. However, the number of homes sold in October dropped 11.43 percent compared to last year, and the pace of new listings coming onto the market is slow with 9.87 percent fewer homes year over year. Notably, 2016 represents a new record low in listings for Ovctober with 6,731, compared to the previous low record in 2014 with 6,748 listings. From 1985 to 2015, average active listings for October is 16,615. For comparison. the record high was October 2006 with 29,722 listings. Establishing a home’s market sales price is equally important to buyers, sellers, lenders and real estate professionals. To help transactions proceed quickly and efficiently, sales professionals and appraisers both utilize information from the local Multiple Listing Service (MLS). The MLS is a professional member-based cooperative that contains a wealth of information including active listings, homes that have recently sold, tax roll data, historical data, and market trends such as how quickly homes are selling and how close they sell to the original listing prices. Using this data, licensed real estate professionals prepare a comparative market analysis (CMA) reports to help sellers choose a listing price for their homes and to help buyers make offers. The CMA is a consumer-facing report that includes recently sold homes and homes for sale that are most similar to the seller’s home in location, appearance, features, and general price range. If the buyer is receiving financing through a bank, the bank will order an appraisal, using the same MLS data, but with some differences. A bank appraisal is performed by a licensed appraiser to determine market value. Comparable homes similar to those in a CMA are used to compare physical features, property tax records and recent solds to determine whether values are trending up or down. In short, the CMA introduces consumers to the ever-changing marketplace of homes for sale and those properties that have recently sold. 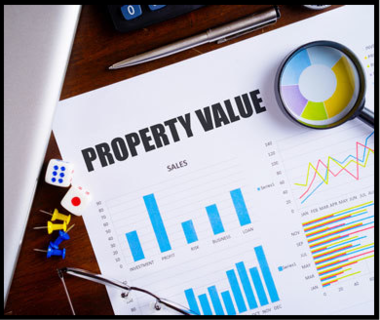 The appraisal determines market value for the bank so that the bank doesn’t lend too much money on a single property. Together, CMAs and appraisals help consumers buy and sell homes. Inspired by the British arts and crafts movement of the late 1800s, Craftsman homes celebrated wood, stone, iron, ceramic and glass artistry and craftsmanship. They had their heyday between the early 1900s and 1930s and were glamorized by leading architects such as Frank Lloyd Wright. Demand for down-to-earth housing arose after the fussy, formal Victorian age. Instead of separate rooms for every purpose, Craftsman homes featured open floor plans with few hallways. Dining rooms with built-in cabinetry replaced butler's pantries. Storage and furniture solutions evolved, with more built-in bookcases, closets, benches and banquettes, reducing the need for extra furniture. Practical bungalows became the rage and expanded into mansions. The original Craftsman homes were unpainted and the natural materials left untreated, including stucco. Emphasis was on the design elements of wood, glass, and metal. The Craftsman movement also called for reduced dependency on artificial light, so homes were designed with numerous windows. 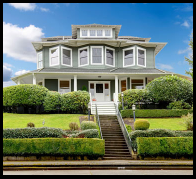 How do you spot a Craftsman home? It will often feature inviting bay windows and a front porch with a low-pitched, gabled porch roof held up by tapered stone, wood or brick square columns. The wide overhanging eaves show exposed rafters. Inside, all-wood trim, beamed ceilings and built-ins are in natural wood tones or stains and embellished with Art Nouveau wallpaper and tiles. Think Tiffany stained glass, Rookwood tiles and William Morris wallpapers with lush post-impressionistic designs in earth tones of woods, mountains and seascapes. Craftsman houses feel earthy and homey, and are always built to last. Of course you want your next home to reflect your style and taste, but sometimes the best home for you isn’t the best-looking home on the block. 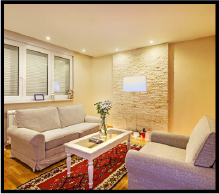 There’s a compelling argument for choosing the home that needs a makeover – often called a “fixer-upper” - and then making adjustments to make the home just right. Most buyers want a property that is move-in ready, and don’t have the experience or patience to remodel a home. Some are reluctant to hire contractors for fear of getting in over their heads, especially if they’re first-time homebuyers. And then there are buyers who simply can’t visualize the home transformed to their liking. In August 2016, the median sales price of new houses sold was $284,000, while the median existing home was $240,200. Both new and existing homes are at a 4.6-month supply nationwide, and the homes selling quickest are those that require the least alterations. Buyers will pay a premium for a move-in ready home, while it’s possible to purchase a less-than-perfect home at a considerable discount. It’s also much easier to negotiate on a home that isn’t attracting multiple offers and closed bids, which tends to happen when a home is ready to be lived in right away. 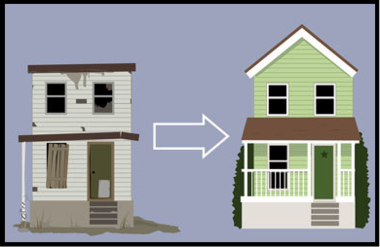 Buyers of fixer-upper properties will also be able to afford to live in a better neighborhood, where they may have the least impressive house, but where the desirability of your neighboring homes will help raise the value of the home they bought. This house may not have granite countertops in the kitchen or hardwood floors throughout, but those are features that can be easily installed. Thinking of purchasing a home? Ask your local Berkshire Hathaway HomeServices Rocky Mountain Realtors for advice on fixer-uppers and to show you exactly how to turn a homely house into the home of your dreams.